The country of Machu Picchu and 4 000 types of potatoes. Machu Picchu was breath taking, especially after 30 minutes bus ride on the steep and curvy mountain roads. As potatoes are a staple part of the Polish cuisine, I was thrilled to widen my “potato horizons”. However, what made the biggest impression on me was ceviche. This is a dish made of raw fish and is in fact so popular that it has become the national dish of Peru, with the Peruvian population celebrating even the National Ceviche Day! Preparation of the dish varies across the countries of Latin America, and beyond. Hungry travelers can taste it prepared in local way, amongst others, in Colombia, Ecuador (e.g. shrimp ceviche), Honduras, Chile (e.g. made of halibut), El Salvador (Ceviche de Concha Negra, aka the Black Clam), also Mexico (served with tostadas), Panama (e.g. from white sea bass) and the Caribbean (dish is prepared with coconut milk). Similar dish is prepared in Philippines under the name of kilawan. I discovered it after 5 hours of bumpy flight over the Andies during the local winter. We landed in the wee hours of the night in Lima and our Peruvian guide started updating us on local history, quirks, sights and food. From all of the dishes displayed on the slide presentation on his iPad at 3am, raw fish was what caught my attention. I did not, however, have a chance to actually try it till we arrived in Cusco some days later. We found a little local restaurant hidden on the second floor on one of the side streets of the town. 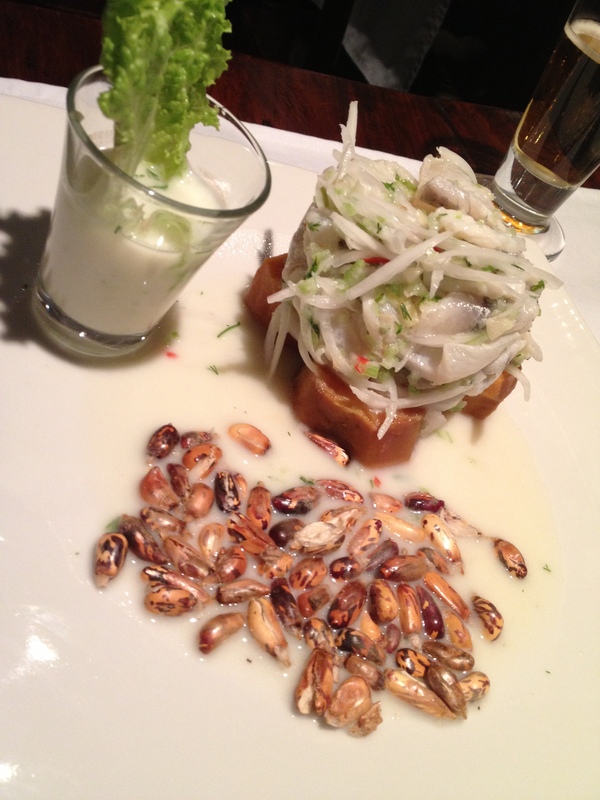 Menu included quinoa soup, orgia de patata (yes, you read it correctly), and kingfish ceviche. I ordered it at once. Ceviche is usually made of raw fish, lime, cilantro, aji, onion. Mine arrived on a toast, with a shot of pisco sour. And what an experience it was! While not very complicated fish dish, it made nonetheless my taste buds dance!